I have to be careful with this post because hospitality is a subject I care deeply about. Just the fact that Making Room : Recovering Hospitality as a Christian Tradition discusses one of my "pet topics" is enough to make me predisposed to love it. Now, hospitality comes easy to me in some ways. It's easy enough for me to come up with creative and different ideas for having people over. I don't mind large groups and our home can accomodate them. It does not scare me to plan a meal for other people or to invite them into a home that is not perfectly in order. (Although I also confess that I do try to put the house into as much order as possible before guests arrive. I've had to learn to lighten up on that point.) Despite the fact that hospitality naturally comes easy to me, that does not mean I always enjoy it. I get stressed thinking about The State of the House. Having small children, planning to host a group of 15-20 people for lunch after church on Sunday honestly feels like more responsibility than it's worth sometimes. But I know the truth: it is worth it to have each one of those people over, for it builds unity in the Body of Christ. And a unified Body is a sight to behold! Sometimes the noise that guests make bothers me. (I'm easily bothered by noise.) Sometimes their family traits get on my nerves. Sometimes a guest goes off talking about things I either don't care about or wish they wouldn't talk about. Sometimes I burn food. And frequently I discover my silverware has spots on it. I always notice this when something requests the fork I forgot to set out and so I have to hand them a utensil which looks questionable. Having people into one's home does indeed involve a certain amount of humility. Especially since my youngest child is currently in the throes of testing her independence at the table. Does she or doesn't she have to eat the food she doesn't like? She randomly "poses" this question to us and it's painful when she decides to test the limits of our authority in front of others. The fact is, the Bible commands all Christians - not just those with some inbred desire - to practice hospitality. Our homes are to be open both to our fellow Christians as well as to strangers. We are to be aware of those who are in need and stand ready to seek to meet their needs. There is no "opt out" box to check on our Christian work sheets. If we aren't good at it, we are to get good at it. And how do you do that? Practice. 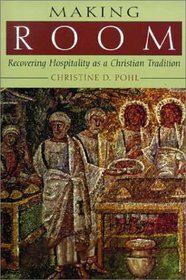 In Making Room , author Christine D. Pohl isn't discussing the "how to" of hospitality, but rather the history of it. She traces the practice of it back to the early church, showing how it was the church who used to welcome strangers into homes. The church used to minister to the sick and the needy. She shows how the introduction of hospitals and hotels effected changes in society which have come about to the detriment of the church. (Really, if the church isn't meeting the needs of the orphans and widows, the Church is sick and needs attention. It's no help to the Church when it refuses to do the job it was created, in part, to do!) In coming up with excuses not to practice hospitality (i.e., "my house is too small", etc.) we have become a more individualistic society who are more focused on self than at any other period of time in history. As this book focuses on the history of hospitality, there is a lot of discussion of hosting the stranger. It might be tempted to try to compartmentalize this book outside the realm of the reader's own Biblical responsibility to practice hospitality because Pohl spends so much time talking about the alien and stranger in the midst. However, it is easy enough to argue that most people you know are strangers to you and your family. Even families a few pews over from your own are generally unknown these days. We have closed ourselves to true Christian fellowship because we feel we are too busy. We have baseball games, school and our own family private time to consider. Now, let there be no mistaking the fact that I consider family time to be excessively important but the church is not made up of just OUR family. And if it is, there is a much larger problem in existence, to be sure!
" . . . [T]he theological and moral foundations for Old Testament hospitality were tied closely to Israel's special relationship of dependence on and gratitude to God. Isreal's obligation to care was nurtured by an emphasis on its own experience as an alien and by reflection on God's gracious character. The teachings of the Law, the warnings of punishment for disobedience, and promise of blessing on obedience reinforced Israelite hospitality towards strangers, as did the the individual hospitality stories: guests might be angels, messagers from God, bringing divine promises or provision. I am speaking to Christians by reminding you that we love because He loved first. We are generous to others with our time and resources because He was generous to us. We reflect Him to those around us. And we cannot do that if we insist on being alone with only our family in our house. We must learn to share ourselves with others. We are not to live for self alone. We were not designed for that. Rather, we were designed to be a part of the Body of Christ - the visible church of God on earth - and we are to be aware of the strangers in our midst, as discussed earlier. And what this all boils down to, essentially, is being willing to sacrifice time, energy and resources. That can be painful to think about but when you consider what you gain in giving of these things, it far exceeds the expense. There is a good return for giving of your time to someone else. Time. It's something we all are inclined to say that we do not have enough of. So then we have to go back to scriptures and determine how we are to best spend our time. What is required of our time? Well, one thing that is required is that we seek to be hospitality and do not grumble about it. With that in mind, it's high time we clear the calendar and recover the rich tradition which is Christian hospitality. Maybe it means you skip participating in a particular after school activity. Maybe it means you eat beans a few times a month in order to be able to afford a meal which will include others outside of your family. Maybe it means you do not finish reading a book as quickly as you like. Maybe it means suffering some humiliation when a child defies you in front of a guest. It might mean all of those things and you certainly need to consider dealing with a few of the above issues in a correct manner. For example: the book should likely be set aside quickly but the child should be dealt with at the earliest possible convenience. And what do you get in return? Sometimes all you get is the satisfaction of knowing that you were obedient in what God called you to. But most of the time you will be the recipient of sweet fellowship which aids in unifying a branch of the Body of Christ of which I hope you are a member. Hospitality may feel like work, but it is a blessing that is really beyond measure. Bottom line: you're called to it. So we must do it and thank the Lord that He rewards us so richly in the process. It is not a chore - it is a true delight! Sounds like some good to think on as we consider the history and implement hospitality into our present lives. What are your thoughts on hospitality to the stranger who is not a believer? I just put this book on hold at the library - thank you for the recommendation. "A unified Body is a sight to behold." - I just love that. @Annette - In response to your question, I think it should be practiced. (She does talk about the issue of safety with strangers which is a valid consideration these days but I don't think is what you are getting at with your question.) You have to ask yourself the question, "Who is my neighbor?" and we have a parable that answers that question. Definitely non-believers should see how the Body works and they should see the love of Christ in the hospitality that they are given and receive. Hospitality doesn't come easily to me -- I don't know why I get extremely nervous about it all. Yet I know I am still supposed to practice it and that God will help me. I also should have learned by now to simplify. We had some folks over Sunday night after church. I was originally going to have them over on Saturday and toss together an easy crockpot meal, but one couple couldn't make it then, so we went with Sun. night after church. The crockpot meal seemed too "heavy" for that, so I made a bunch of finger foods, even with the other ladies bringing something as well. In the middle of all the cooking, I thought, "When will you ever learn?" Usually at some point in getting ready I think, "Why did I ever schedule this?" But once the people get there I am glad we did. Often I have thought of those incidences, like Abraham's guests, when they had to start from scratch and kill a calf for dinner when people came. That involved a great deal of time and trouble -- yet we're supposed to be willing to put forth that time and trouble to minister to others. I suddenly realized in reading this post (forgive me for it taking so long) that Offering Hospitality is no longer an active blog. I did enjoy that, but understand you have your hands full! Yesterday at MOPS, we were asked to state characteristics that make our family who we are, and one of the things I said was hospitality. I have a love / hate relationship with hospitality. I do love having people over here and am fairly relaxed about hosting, entertaining, cooking, etc. My hesitation is that I am about 80% introvert and 20% extrovert (-ish, I'm guessing on these numbers, ha!) and when guests are gone, I am wiped. Then I am a poor parent to my poor tired overstimulated children I now have to tend to, along with a house to put back in order. But all that aside, it is still worth it to be hospitable and open your home to your church community and beyond. I think people are missing out on the beauty of this because they think they are "connecting" with others on FB and it's just not the same. I like the idea of hospitality and believe in it. I usually feel too busy (or protective of my time). Whether it's a simple lunch date with a woman or having a family over, I hold too tightly to "my time." When I actually just DO it, I enjoy it. I'm okay with not worrying about my house being perfect, and in fact, I've been feeling lately that I need to actually make more of an effort in that area. Speaking of offering hospitality to all, have you read The Art of Neighboring: Building Genuine Relationships Right Outside Your Door? It's a good idea but the audio version is a little annoying, so I don't know if I'll finish. Great review. I keep revisiting it, but just don't know what to say as I keep starting comments that are little more than complaining over how many people we've invited over since we moved here and how few people (read: ONE) have reciprocated. This is a topic I've been thinking about all weekend. I think most of us are like Barbara H., we make hospitality too complicated. We prepare elaborate meals, clean our homes until they are immaculate, and threaten our children to use their "company manners." We set impossible expectations on ourselves, our families, and the event. Expectations of perfection. When I am invited to someone's home and everything is perfect and adorable and I am "served" the whole time I'm there -- I feel uncomfortable. I don't accept invitations because I want to see how perfect her home is or how great a cook she is. I accept because I desire relationship with my hostess. My husband and I are trying to build relationships with other couples/families. So I've committed to having someone in our home once a month. I know once a month doesn't seem like much but it's a doable starting place for me. Potlucks, simple meals like chili and cornbread, and a regular cleaning schedule will help me make this goal a reality. I'm hoping that by the end of next year we will have deepened existing relationships and built new ones.